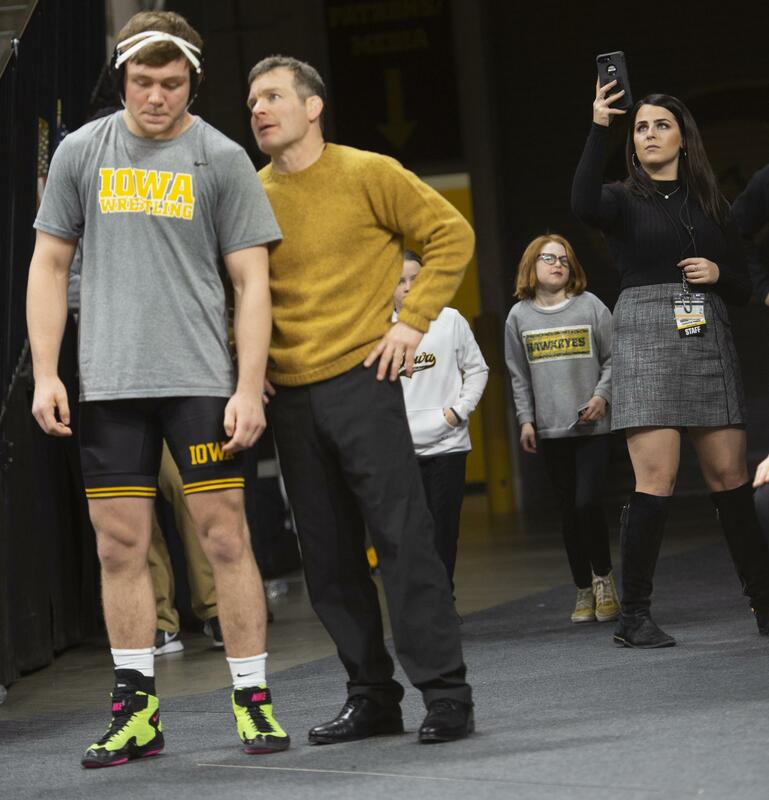 Jennifer Fisher captures video during introductions at a Hawkeye wrestling match against Rutgers. Fisher, a graduate student in sports and recreation management, was selected to run the Instagram Story feature for the National Championship Football game on Monday, Jan. 7. She also got the chance to tour Instagram and Facebook offices. Photo by Tim Schoon. As the Clemson Tigers battled the Alabama Crimson Tide on the field for the 2019 College Football Playoff National Championship title, a University of Iowa Hawkeye was covering the action from the sidelines. Jennifer Fisher, a San Diego, California, native working toward her master’s degree in sport and recreation management at the UI, joined media members from across the country working Jan. 7 at Levi Stadium in Santa Clara, California. The social media platform Instagram chose Fisher from more than 100 students at more than 60 universities in its Instagram Student Section program to take over its official @Instagram account’s story, which has more than 277 million followers. This three-credit summer course for University of Iowa undergraduate and graduate students includes one week in Iowa City performing projects for organizations such as Hawkeye Sports Properties or the Cedar Rapids Kernels and two weeks at the University of San Diego working on projects for organizations such as the San Diego Padres and Farmers Insurance Open PGA golf tournament. Applications for the summer 2019 practicum are due Feb. 15, 2019. Learn more. Fisher didn’t intend to focus on social media as a career path when she started at the UI as an undergraduate, but a career in sports was never far from her mind. “I grew up playing sports, watching sports, and getting involved with sports drives in my community,” Fisher says. While working on a certificate in event planning, Fisher, who graduated from the UI in May 2018 with a BA in communication and minors in sport and recreation management and fine arts, was encouraged to volunteer for an event. After helping with the Iowa Hawkeye football banquet for two years, she was inspired to get more involved in the athletics department. Volunteering with the Iowa Athletics Marketing Department led to an internship and her current position as social media marketing manager. While there, she learned about the Instagram Student Section program, which partners with universities across the country to provide students with best practices, information about the latest product updates, and other opportunities to collaborate with partners in the sports world. As part of the program, students are given access to their schools’ Instagram account with the goal of making fans feel like they’re at the games through first-person content via Instagram Stories. At the end of the season, Instagram chooses one participant to take over its official account and show the student experience at the College Football National Championship. Fisher learned Dec. 7, 2018, that she had won. Jennifer Fisher documenting a wrestling match between the Hawkeyes and Rutgers. Photo by Tim Schoon. Fisher flew into San Francisco on Jan. 4. During the first couple days, she got a VIP tour of the Facebook and Instagram campus in Menlo Park and attended the National Championship media day. After relaxing and exploring the city on Sunday, she was ready for the big game Monday. Upon arriving at the stadium, she did what she always does before a Hawkeye game. Each member of the media was issued a vest, the color of which indicated their level of access. Fisher’s was bright yellow. As kickoff approached, Fisher got to work. She talked with former college and professional football players Tim Tebow and Jordan Rodgers, and she made friends with the mascots. During the game, Big Al, the elephant mascot for the University of Alabama, gestured to Fisher to kneel with him as an injured Alabama player was treated on the field. She also filmed an intro for the Instagram Story. Fisher says covering both teams equally was a challenge, as she usually only focuses on the Hawkeyes and not their opponents. She and an assistant producer for Instagram swapped sides of the field each quarter and adapted their coverage as the game evolved. As she worked alongside longtime professionals in the business, Fisher says she felt confident in her work. Along with her work in the UI Department of Intercollegiate Athletics, Fisher credits a summer practicum as an important aspect of her preparation. The San Diego Sports Consulting Practicum is a three-credit summer course for UI undergraduate and graduate students that includes one week in Iowa City performing projects for organizations such as Hawkeye Sports Properties or the Cedar Rapids Kernels and two weeks at the University of San Diego working on projects for organizations such as the San Diego Padres and Farmers Insurance Open PGA golf tournament. Fisher was one of 16 UI students to make the 2018 trip to San Diego. “It’s a small world when a practicum at Iowa can bring me back to my hometown,” Fisher says. As a lifelong Padres fan, Fisher was thrilled to be assigned to work in a team of four to develop a project related for the organization’s 50th anniversary. Packy Moran, lecturer in the Sport and Recreation Management Program and co-founder of the practicum, says Fisher brought a needed skill set to her clients. Jennifer Fisher sits on the field in the aftermath of the Alabama-Clemson game. Photo courtesy of Will Yoder. “Her social media acumen as well as her understanding of where revenue can be created helped Jennifer lead her group to recommendations that were well received by the Padres,” Moran says. The practicum also included lectures and activities related to networking and giving an effective presentation. Fisher says she’s putting a few things she learned in the Bay Area to use as she goes back to work covering Hawkeye sports. Fisher says she was overwhelmed by the support she received after the Instagram Story published.